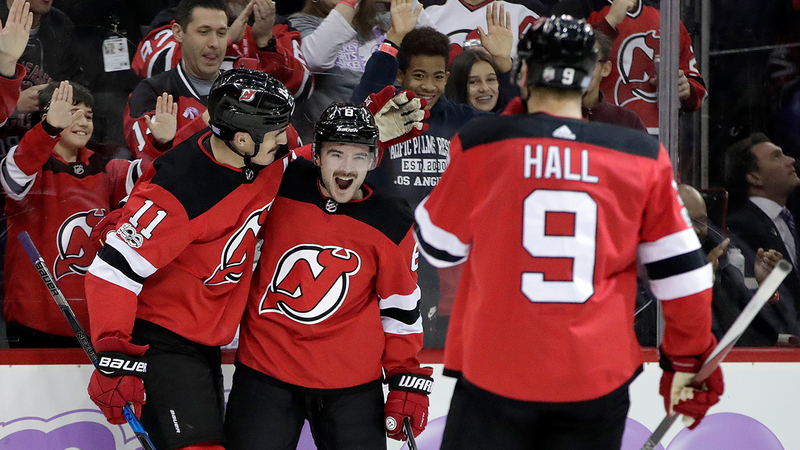 NEWARK, New Jersey (WABC) -- The New Jersey Devils defeated the Vancouver Canucks 3-2 Friday night at the Prudential Center in Newark. But it wasn't just the team's victory that captivated the 16,514 in attendance. Who doesn't love a story of redemption and perseverance? On a night when the NHL and the Devils held a Hockey Fights Cancer Awareness Night, it was Brian Boyle who captivated the crowd. "I was excited to help, and with the crowd -- It got a little dusty again," Boyle said following the game, describing his emotion after getting the game winning goal. Boyle has had tremendous support in his fight with chronic myleogenous leukemia. When asked how he feels about the fans, Boyle responded; "It's a pretty special feeling to feel that support." Boyle went on to say; "It says a lot about the crowd and the fans here -- this particular city, I've felt the love in other cities but this has been the way they've embraced me. I've said it countless times, the fans have reached out ... I saw the signs....it's a very special feeling." Boyle not only gets tremendous support from fans and teammates, but more importantly from his family. When asked about his wife and her reaction to Friday's game, Boyle responded; "What a champ. Two kids, especially my two kids. They buzz around, and I was happy they were there." His wife Lauren and two children were on the ice in a pre-game ceremony marking the occasion in a ceremonial puck drop. Boyle provides veteran leadership for this young Devils team, and a source of inspiration with his ongoing fight. Following the game Taylor Hall spoke of his teammate with admiration. "He's been an inspiration to all of us all year. For what's he's been through, what his family's been through, it's really cool to see him not only playing but playing well." "It puts a lot of things in perspective for us as hockey players," Hall added "To see him score and hear the chants after, it was awesome." The Devils look to make it two wins in a row when they visit the Detroit Red Wings Saturday evening at 7 p.m. The Devils are currently in 2nd place in the Metropolitan Division.